Sociedad Deportiva Deusto is a football club from the Spanish city of Bilbao who were formed on the 13th February 1913 to take over from Fortuna-Deusto FBC who folded around the same time; while Deusto was a separate small settlement. In the 1920’s the winners of the Vizcaya Regional Championship would progress to compete for the Spanish national title. Deusto competed in the top level Serie A and finished in third position behind Athletic Club and Arenas Club in the 1920-21 season, but above the likes of Racing Santander. Before the end of the decade Deusto had been relegated and were even temporary dissolved in 1932 before returning to action after the Spanish Civil War in 1939 as they were crowned as the amateur champions of Vizcaya. The 1940’s saw the club become one of the most prominent in the region before dropping right down to the lowest categories of regional Vizcaya football by the end of the decade. A solution was found in 1950 by joining forces with the University of Deusto as the club became known as Deusto-Universidad, and playing home games in the campus of the University. The club stabilised and grew, becoming members of the national third tier Tercera División for the 1956-57 season. 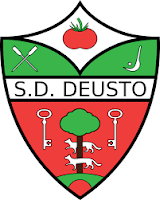 Deusto remained at that level until the completion of the 1962-63 campaign, but regained their Tercera División at the first time of asking. On this occasion their time in the third tier lasted just one season; returning back to Vizcaya regional football. Once again Deusto rebuilt and returned for the 1966-67 season. After two campaigns the club was relegated in 1967-68. Relations with the University cooled by the end of the 1960’s, with a lack of support being received from the educational institution. The club dropped Universidad from their title and returned to play in regional football once more. By the time Deusto returned to the Tercera División for the 1979-80 season, it had become the fourth tier of Spanish football. Deusto started out their latest stint in Grupo III, as well as competing in the Copa Del Rey for the first time. In 1980-81 Deusto moved with other clubs from the area to Grupo II for one season. In 1982-83 the club competed in the Copa Del Rey once more. After a few lower mid table finishes, the team finished bottom of Grupo III in 1984-85 and were relegated back to Vizcaya regional football. ‘El Tomateros’ as Deusto are nicknamed, owing to their red shirts spent several seasons playing in several of the top three divisions until they moved into their new 1,000 capacity Campo de Fútbol de Etxezuri on the 29th August 2005 with the first team competing in the second level Territorial Preferente. The performance won the club promotion to División de Honor; the top level of Vizcaya regional football, and one of numerous fifth tier divisions in Spanish football. The 2010-11 campaign saw a sixth place finish, before Deusto ended in fourth spot the season after. The 2014-15 season saw SD Deusto win the División de Honor de Vizcaya championship to return to the fourth tier Tercera División, where they were placed in Grupo IV; finishing in sixteenth place. The 2016-17 campaign saw Deusto’s development continue as they weighed in with a seventh place finish. SD Deusto will play in the Tercera División Grupo IV in the 2017-18 season. My Sunday was going beyond my wildest dreams after a fantastic visit to the morning match in the División de Honor between Erandio Club and Lekeitio, where the locals had treated me like royalty. I’d even seen a brass band march from San Agustin Plaza before taking the Metro a couple of stops to Sarriko, where I alighted and walked a few hundred yards in the twenty degree sunshine across Parque de Sarriko to Campo de Fútbol de Etxezuri. The venue was in keeping with many similar facilities in the area. One side was dominated by a raised covered stand built into a hill, with minimal spectator facilities on the other three sides around the artificial playing surface. A match had just finished and players, spectators and coaches were congregated near the players changing rooms taking in much needed refreshments. I took my photos and headed off. My walk took me through the interesting centre of Deusto, which had numerous eating and drinking opportunities as well as local shops. I needed a rest so I headed back for a siesta before the Athletic game; although I inadvertently returned the following day.